Alaskim | Surviving Wildlife, Wildflowers & Wild-Haired Children: Why Do I Do This to Myself? 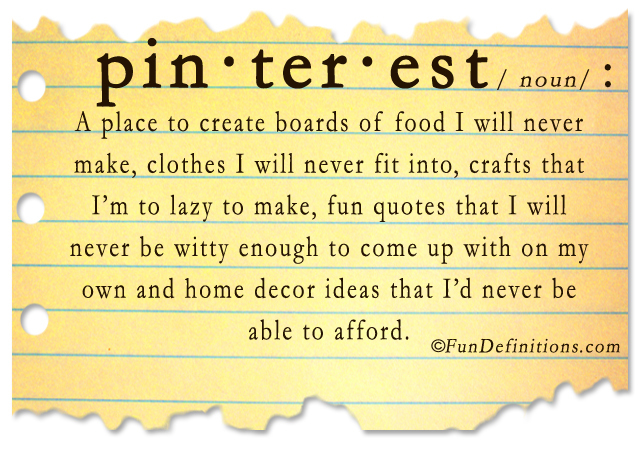 Have you heard about Pinterest? For the two of you who haven't been sucked in by its evil magnetic force, Pinterest is an online service that allows you to create virtual pinboards. For example, when I was planning our trip to Maui, I collected pictures (and corresponding websites) of activities we might want to try while on vacation. Since I didn't have any summer clothes (sadly, my running shorts and sports bra from 1996 no longer fit), I set up a second board where I pinned pictures of cute items I might want to purchase for our visit to the islands. I started a third board for hairstyles that I wanted to attempt on my daughters' heads. Those pinboards were functional, useful, and . . . a gateway drug. I am now addicted to Pinterest. I'm not only pinning silly things, like video clips and funny quotations, but spending far too much time perusing the boards of others who have pinned all kinds of amazing images and ideas and links to sites that show me step-by-step how to fold my fitted sheets properly. I just type in organization into the search window, and spend the next hour oohing and aahing at all the ways I'm going to straighten up my house. I am slowly coming across many of my fellow bloggers, who are more addicted than I, so that makes me feel good. I am not the worst out there, and shall scream that little reminder at my husband whenever he complains that the glow from my laptop is keeping him awake at night. One of my pins really struck a chord with people and has been re-pinned over 200 times. It's an art project that I plan on doing with my 11-year-old . . . just as soon as I can find the willpower to pull myself away from Pinterest. 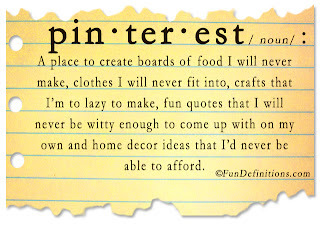 I love Pinterest, but I don't spend nearly as much time there as most of my friends do. Resistance is futile. Ha! Actually, I'm trying not to go over unless I'm looking for something specific. "Surfing" is too dangerous. It's worse than when I was hooked on Farmville on FB a few years back! Why? Because I keep telling myself that I'm actually going to DO all this stuff. Seriously, though, I have found some wonderful recipes, made some great Christmas gifts, and used no less than two dozen "why in the world didn't I think of that?" tips (like storing a whole set of sheets in a pillow case, covering an ugly box spring with a fitted sheet, cleaning EVERYTHING with a mixture of warm vinegar and blue Dawn . . . I'm addicted to Pinterest as well. My justification is that every so often I actually do the things I find on Pinterest. It's internet crack.